Info "I've seen that guy before. Looks like he's getting dumped." Dear John Letter is one of WarioWatch's microgames in WarioWare: Twisted! The name comes from the term "Dear John", which means that someone is breaking up with their relationship with a note and not in person. The purpose of the game is to tilt or spin the Game Boy Advance to make a stickman "get dumped" or get dizzy. 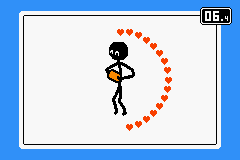 Each small part of a spin will remove a heart icon; the player wins when there are no hearts left, meaning the stickman is dizzy. The player starts off the game with 4 seconds. 1st level difficulty: There are 16 hearts. The system has to spin a bit to make the stickman dizzy. 2nd level difficulty: There are 24 hearts. The system needs to spin a bit more to make the stickman dizzy. 3rd level difficulty: There are 32 hearts. The system has to spin even more to make the stickman dizzy. This page was last edited on September 27, 2018, at 18:52.